The VTR (Video Tape Recorder) pictured is the monochrome Ampex Quadruplex VRX-1000, a 2″ reel to reel machine running at 15 inches per second featuring four video heads on a rotating drum scanning the 2″ video tape transversely (vertically). The container pictured on the left side of the VTR held kerosene which was applied with a tooth brush to the spinning video heads of the VTR when ‘banding’ was observed in the video, meaning that a video head had become clogged with oxide off the tape. Sunwapta had 3 Ampex VTR’s, the fixed unit seen in the photo and two others in mobile vans for recording remote broadcasts. 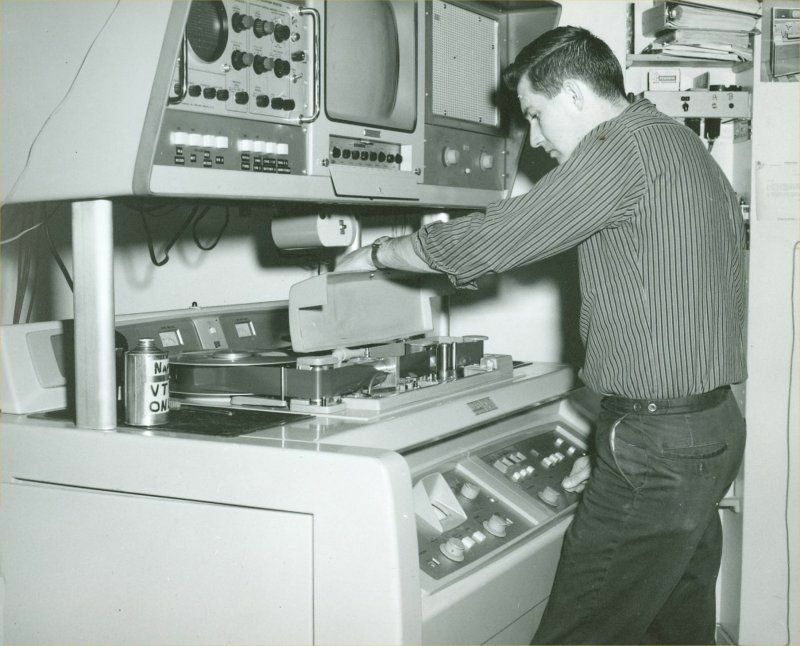 The VTR operator in the photo is Leon Blais; photo was taken about 1963. Fred Hodson (elsewhere on this site) worked at the time in television audio and video operations (along with Leon in Engineering). Chief Engineer for CFRN-TV Sunwapta Broadcasting at the time (early 1960s) was Ted Wadson, assistant engineer was Ray Bresden.